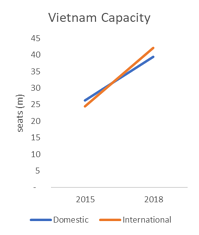 Vietnam has seen phenomenal growth in aviation by any standard in the last few years. From a country known for its place on the budget backpacker trail, it has shifted seamlessly into a must-visit destination for the emerging Asian market as an influx of tourists with money in their pockets want to see one of the world’s last few unexplored destinations. Aviation plays a key role in this with 84% of tourists using air travel to arrive to Vietnam, according to the World Tourism Organization. International capacity has almost doubled in the last 3 years, growing from just 24 million seats in 2015 to 42 million in 2018, outpacing growth seen by its near neighbour, Thailand. By comparison, it took Thailand eight years to grow international capacity from 30 million seats in 1996, the first year for which comparable OAG data is available, to over 42 million in 2004. For the first time in 2018, there were more airline seats on international routes than domestic ones, boosted undoubtedly by the decision in 2018 to offer visa-free travel to residents from 24 countries. Over 90% of Vietnam’s international capacity currently operates to other destinations in Asia. In 2018, nearly two thirds of seats operated to countries in North East Asia, which are also the fastest growing country markets. South Korea is by far the biggest inbound market, and fastest growing, with 110 flights per day between the two countries. 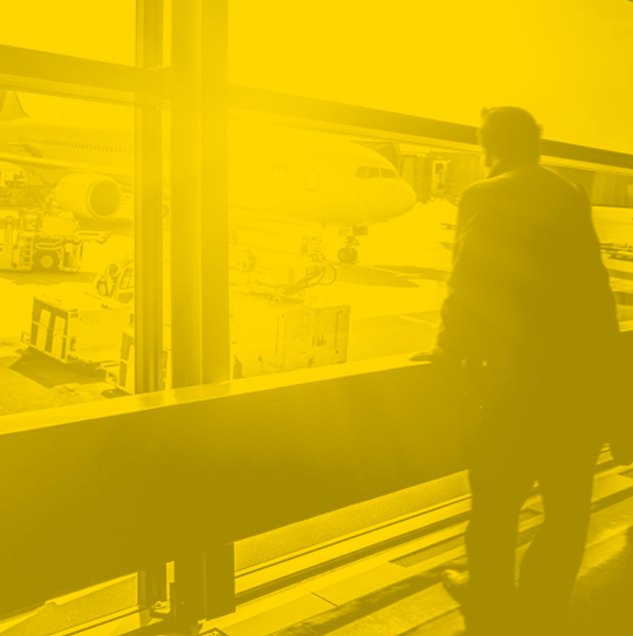 Seat capacity was three times bigger in 2018 than it was just three years earlier and airlines have grown the number of routes from 8 to 19 over the same time period. One of the most popular destinations amongst South Korean tourists is the rapidly growing beach resort of Da Nang which has seen capacity grow from just under 0.4m seats to 2.8m in 3 years. Capacity from China has also seen strong growth, with airlines adding 49 new routes in the last 3 years to reach a total of 93 in 2018. However, there is a lot of churn in the tail-end of routes with 24 being dropped and 30 being introduced between 2017 and 2018. There were 17 airlines that operated routes between China and Vietnam in 2018, of which China Southern and Vietnam Airlines were the largest with almost a third of capacity each. 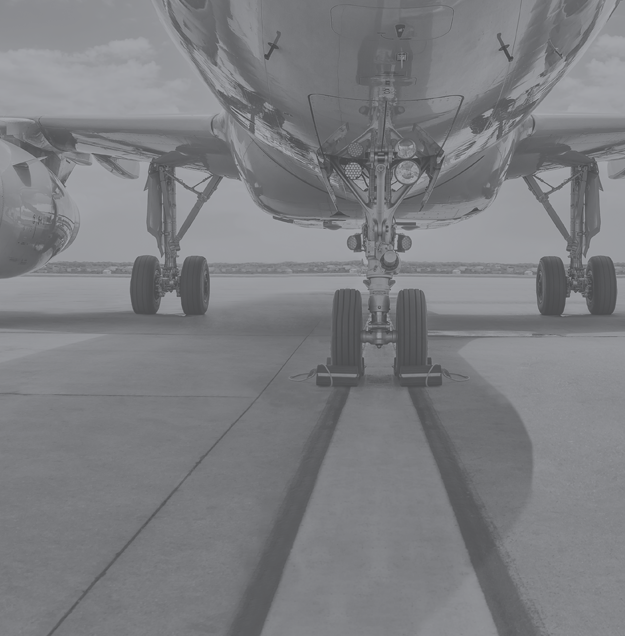 The last few years have seen the share of capacity operated by Chinese carriers increase, and is currently just over 60%, as smaller Chinese airlines enter the market and provide services from a range of Tier 2 cities in China. 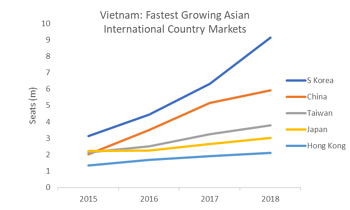 Vietnam’s appeal extends way beyond Asia and although the markets are much smaller, there are some pockets of high growth taking place, particularly from Europe and the Middle East. Capacity from Qatar has seen very strong growth, almost tripling in size over three years, whilst Russia has also seen growth increase substantially between 2017 and 2018. The UAE has also seen a strong shift in capacity. 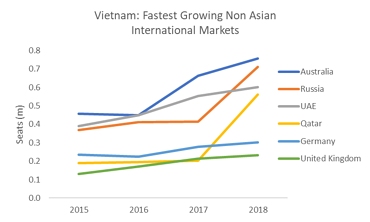 Looking behind some of these numbers highlights that these countries are acting as hubs for some key European markets which do not currently have enough direct capacity to service demand for travel to Vietnam. Except for Russia, the other 4 of Vietnam’s Top 5 European source country markets have more passengers travelling indirectly than directly. Many of these passengers are routing through the Middle East (Qatar or United Arab Emirates) or through Russia. 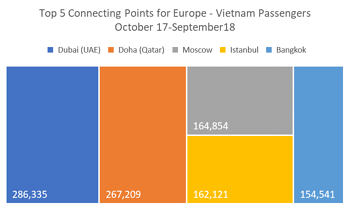 When we look at the routings for passengers travelling from Europe to Vietnam, the biggest indirect flows are through Dubai (in the UAE), Doha (in Qatar) and Moscow (in Russia) with over 700,000 passengers travelling through these three hubs in the 12 months to September 2018. 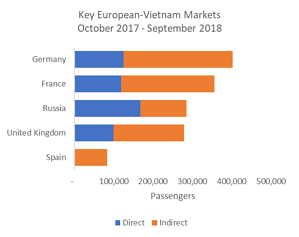 Whilst these indirect routings may offer passengers a price competitive alternative, and in some cases the only alternative, the scale of these indirect markets indicate there is plenty of scope for new direct services; particularly from Germany where in the 12 months to September 2018, over 275,000 passengers travelled to Vietnam indirectly, and from France, where over 236,000 passengers travelled indirectly. A consequence of all this additional capacity has been Vietnam’s astonishing growth in tourism and the tourism sector appears to be finally receiving the investment needed to ensure that the Vietnam brand is about much more than backpackers.